SATs stands for Standard Assessment Tasks. These are national tests in spelling, punctuation, grammar and reading and maths taken by children at the end of both Key Stage 1 (Year 2) and Key Stage 2 (Year 6). Writing is assessed by the teacher. You can find out more on our KS1 SATs and KS2 SATs pages. 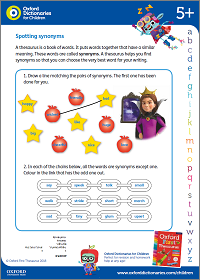 Children check their own work against a set of answers or criteria or swap with a partner to mark each other's work before then discussing the marking or comments. Proven to be an effective tool for learning. A semicolon can be used between two related main clauses. For example: The film was brilliant; I had a great time. A semicolon can separate longer phrases in a list that has been introduced by a colon, or which is more complicated than a simple list of words. For example: The children need to bring with them: a hot-water bottle or an extra blanket if the weather is cold; a cup, a plate and a bowl; a knife, a fork and a spoon. Do not use a comma to join sentences or main clauses. If you want to join sentences using punctuation, choose a semicolon, a colon or, if you are writing informally, a dash. A sentence tells you something, asks you something, asks you to do something or exclaims about something. In writing, all sentences start with a capital letter and end with a full stop, question mark or exclamation mark. Sentences consist of one or more clauses. All sentences have a verb and, in most sentences, the verb has a subject. Single-clause sentence: A single-clause sentence consists of one main clause. For example: The bird ate the apple. Multi-clause sentence: A multi-clause sentence consists of more than one clause. A set of things (usually numbers) that are in an order. Each number in the sequence is called a term. To find missing terms in a sequence, first you need to find the rule behind the sequence. For example, in the sequence '2 4 6 8' the rule is to add two to the previous number. The next number in the sequence would be '10'. This term is used in curriculum documents and refers to work done with shapes, spatial awareness, (for example, volume and area) and measurements (for example, centimetres, metres and litres). Words you need to learn by sight because they cannot be easily sounded out. (Also see tricky words). The singular of a noun is used when there is only one. To say the individual sounds that make up a word (sometimes also called Fred Talk or Robot Talk). An abbreviation often used in schools for spelling, punctuation and grammar. Also referred to as GPS. A term used to cover a wide range of needs that may need additional support whether a child is falling behind or far exceeding normal expectations. A sentence that tells you something. For example: I love fruit. The teacher reads a story aloud to the whole class. Take a look at our storyteller videos. The subject of a verb is often who or what does or is something (the do-er or be-er). In a statement, the subject is usually the noun, noun phrase or pronoun just before the verb. For example: The bird pecked the apple. In a sentence, the subject and the verb agree. The apples are on the tree. ? The bird eats the apple. ? Subjunctive forms can be used in formal language to show that something must or should happen. They can also show that something is unlikely or uncertain. For example: If I were able to take up a position with you, I would be diligent and punctual. I note your requirement that applicants be experienced. Video: What is the subjunctive? A subordinate clause helps to give more meaning to the main clause. It cannot exist on its own as it is not a complete sentence. A subordinate clause often starts with a subordinating conjunction such as 'although', 'because', 'before', 'if', 'since' or 'when'. For example: The bird pecked the apple before it flew away. Video: What is a subordinate clause? A morpheme that can be added to the end of a root word. Different suffixes have different meanings so, when you add a suffix to a word, you change its meaning and make a new word. fast + er = faster. sad + ness = sadness. joy + ful = joyful. hope + less = hopeless. apple + s = apples. advert + ise = advertise. Video: What are prefixes and suffixes? A word or part of a word that contains one vowel sound when you say it. A syllable sounds like a beat in the word: 'Vow-el' has two syllables; 'Con-nec-tive' has three syllables. Words that mean the same – or nearly the same – as each other, such as 'big' and 'huge', or 'horrible' and 'nasty'. 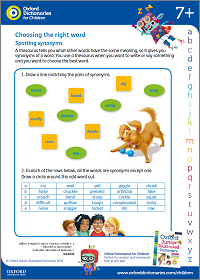 The opposite of a synonym is an antonym. For example: They lived in a big house. They lived in an enormous house. Video: What are synonyms and antonyms? Blending or merging the sounds in a word together in speech so you can read the word.